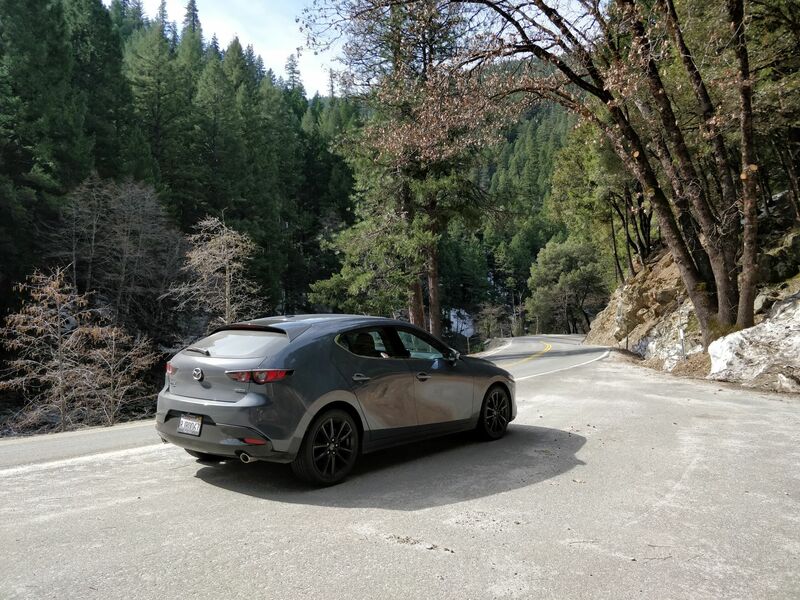 Every time I threw the 2019 Mazda3 luxury compact sedan into one of California State Route 49's seemingly endless supply of twisties, an audible, plastic-on-plastic protest could be heard from deep in the center console. A nuisance, sure, but not one that bothered me too much, considering what a pleasurable distraction it is to huck the new Mazda3 around turns. For 2019, Mazda's compact—a.k.a. the "fun one" of the segment—is all-new, all grown up, and—for the first time—all-wheel drive. It's Mazda's first car to be made under its new quasi-luxury "Mazda Premium" ethos that aims to usher in more plush, quiet interiors, and sophisticated minimalist designs. To give you an idea of the level of fancy we're dealing with here, Mazda design boss Ken Saward told me that the thinner font used for the new Mazda logo apparently took the company's graphic designer a year to develop, and was inspired by Japanese calligraphy. Don't think for a minute, though, that the new car has lost the previous 3's positively entertaining driving experience for a buyer transitioning to the high life. 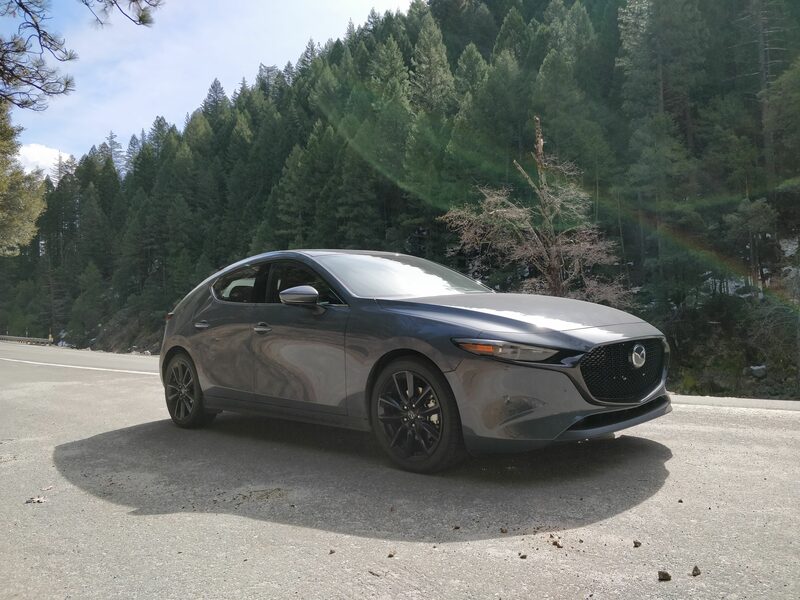 As I discovered piloting the compact Mazda from snow-caked Lake Tahoe to Sacramento, it remains a more-than-willing dance partner when the road gets wild. Powertrain: 2.5-liter Skyactiv-G four-cylinder producing 186 horsepower and 186 pound-feet of torque; FWD is standard, while AWD adds $1,400 and around 170 pounds to the curb weight. Quick Take: Even without Skyactiv-X, the 2019 Mazda3 is a luxurious and fun daily driver that continues to punch well above its price point. 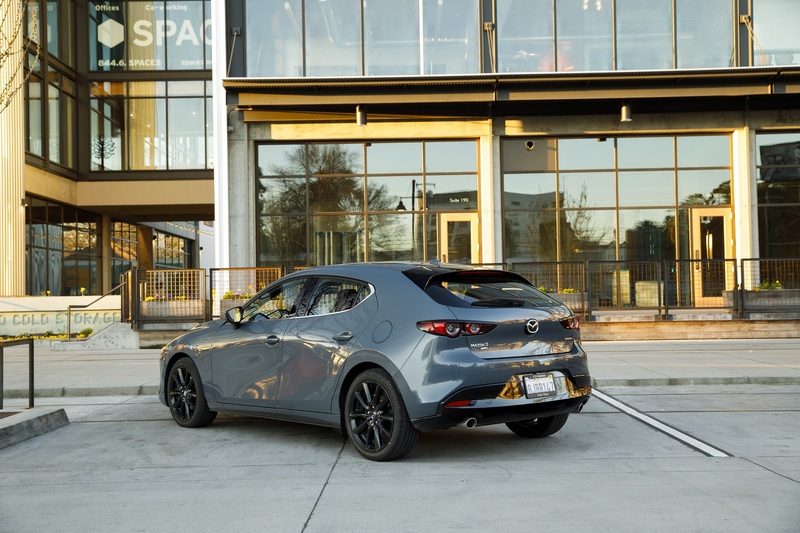 When putting together the 2019 Mazda3, the Japanese automaker set out to make every aspect of the car seem natural and decidedly human, starting with the exterior. 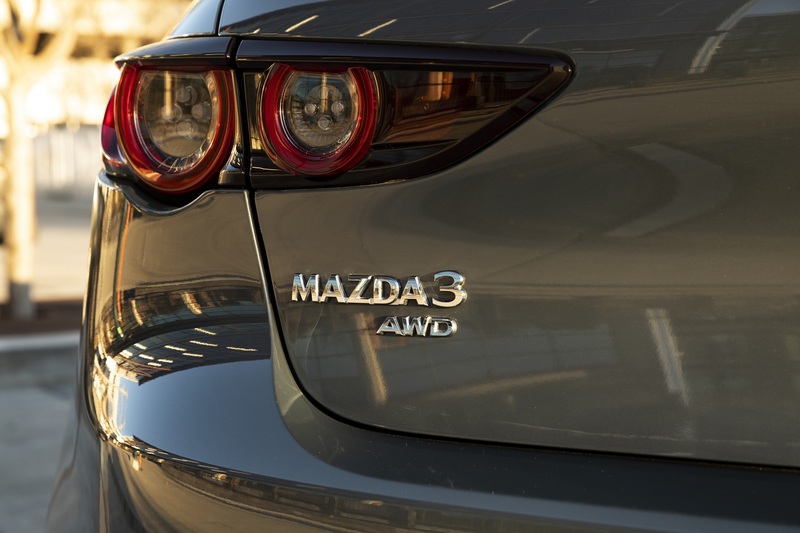 Mazda did away with any so-called character lines down the side of the hatchback model, resulting in a fluid, melting jellybean-like shape—not dissimilar to the Kai Concept revealed in Tokyo back in 2017. Mazda claims its designers spend more time than any other manufacturer sculpting cars with clay rather than software. The company has even calibrated the assembly robots that apply paint to mimic the movements of living, breathing craftsmen at the expense of efficiency. Something tells us if the cost of Japanese labor was low enough for Mazda to build its cars entirely by hand, it would. The handcrafted vibe extends to the interior as well. Somewhat reminiscent of the innards of an alien spaceship, the Mazda3's less-is-more cabin is filled with soft, flowing shapes and beautiful materials that'd embarrass a good number of entry-level luxury cages. It's a clean interior with comfortable seats and controls that are exactly where you'd expect them to be. All of the knurled knobs and switches click in a uniform, satisfying fashion. Even the turn signal indicator lights have become mere green outlines of an arrow rather than actual, filled-in green arrows. How's that for minimalism? Mazda's latest compact car is a supremely nice place to sit on a budget—in a segment already filled with nice places to sit on a budget. Just when the new and better-than-ever Toyota Corolla Hatchback thought it became swanky enough to sit at the cool cars table, Mazda has raised the bar another rung. The 3's ultra-wide, 8.8-inch infotainment screen sits high in the driver's line of sight and is super sharp. A dedicated graphic and short description accompanying every little system setting is a welcome addition that puts an end to the guesswork when setting up exactly how you'd like the tech in your Mazda to behave. And because common sense dictates that using a touchscreen requires one to look at said screen and, thus, has no place in the cockpit of a car (don't @ me), the center display on the Mazda3 thankfully cannot be operated by touch. Things aren't perfect though. Aside from that creaky cup holder that we're gonna chalk up to either early-production teething or journalist abuse, the 3's small greenhouse and chunky C-pillar do outward visibility zero favors. Oh, and the black plastic engine start button felt a little cheap given how good the cabin that surrounds it looks. Once you get past the button and start it up, the new Mazda3 proves to be a very competent commuter. Mazda vehicle dynamics manager Dave Coleman says engineers have tuned every aspect of this car's driving dynamics and inputs based on the human gait, making a drive feel as natural and easy as going for a walk. Sure enough, puttering around town requires almost no learning curve and called for very little recalibration of my body's relationship with the steering wheel, gas, or brake pedal. The car pretty much does exactly what you want it to do from the get-go. Spooky. This "it just works" theme extends to more spirited driving as well. Pounding a Polymetal Gray hatchback tester around the curvaceous roads north of Tahoe National Forest revealed quick, responsive steering. Front-biased all-wheel drive evolved from the CX-5 coupled with G-Vectoring Control Plus—a proprietary system that culls torque to alter balance and make cornering feel more natural—provides loads of confidence and an unflappable demeanor in the corners. A bit of a surprise considering Mazda has decided to fit the 2019 Mazda3 with a torsion beam rear suspension, a relatively primitive shock-absorbing technique the company says makes for simpler, cleaner, and more natural movement. On the road, if there were any detriments to using the torsion beam rather than the old car's multi-link independent rear end, I couldn't feel 'em. In short, this thing is just good, competent fun. Speaking of fun, Mazda is—praise the car gods—continuing to offer the compact with a manual transmission. It'll oddly only be available on the top trim FWD hatchback. Luckily, Mazda had such a six-speed hatch waiting when I arrived in downtown Sacramento because what better way to learn a clutch than to be forced to feather it in rush hour Sactown traffic? Spoiled auto journalist complaints aside, the brief drive in the shift-it-yourself Mazda3 revealed a light and easy-to-use clutch-and-shifter combo that frankly felt a bit like the hardware found on the MX-5 albeit with longer throws. No, it won't evoke the firearm component comparisons typically brought on by manually-shifted Hondas but the fact that a row-your-own Mazda3 continues to exist at all deserves praise. Also deserving of praise is how the 2019 Mazda3's i-Activ AWD and G-Vectoring Control Plus handle snow. 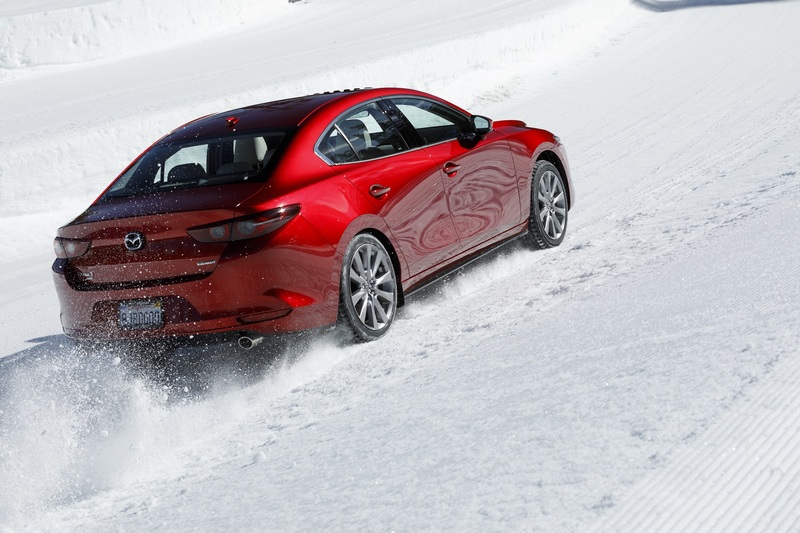 Capable of sending up to 50 percent of the power to the rear axle, the AWD Mazda3 was decently more stable than the FWD model when driven back-to-back on the short, makeshift snow course Mazda had set up earlier in the day. Perplexingly, the FWD car on-hand was only fitted with all-season tires while the two AWD models sampled had all-seasons and winters. Mazda likely won't want me saying this but if you live in an area that gets snow and only have the cash to spend on AWD or a set of winter tires but not both, Canadian wisdom says to spring for the tires. In any case, those looking for affordable all-wheel traction need not be stuck buying Subaru Imprezas anymore. At this point, you may be wondering how and why we've gotten this far into the review without talking about the thing under the hood. Well, the 2.5-liter, 186-hp Skyactiv-G that powers the 2019 Mazda3, for now, gets the job done but really isn't all that exciting or interesting. What will be interesting is the car's upcoming Skyactiv-X motor that uses spark-controlled compression ignition to deliver game-changing power and efficiency. Mazda won't give details on exactly what that'll look like or when it'll arrive in the U.S. but previous reports have pegged it to get around 190 hp and the economy figures of a 1.5-liter diesel. 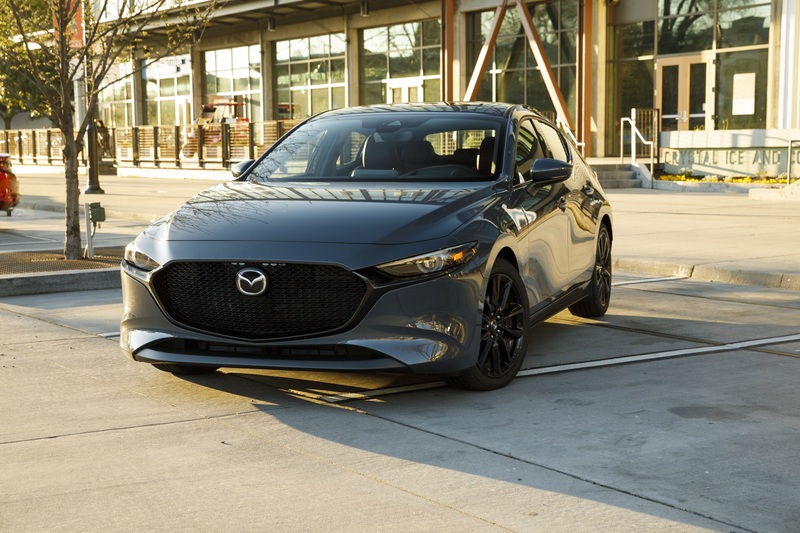 Even without the newfangled engine, though, the 2019 Mazda3's concept car looks, class-dominating interior, near-telepathic inputs, and delightful backroad manners make it a formidable commuter machine.